Walk, ride a motorbike, horse or camel, surf the dunes on a cardboard box or a dedicated sand board or drive over the huge sand banks in a quad runner, with a tour operator or your own 4WD; Stockton Beach is arguably the ultimate destination to fill your cloths and every bodily orifice with sand. If you can’t get your sand adrenalin fix here, you’re simply not trying! Some may say “there’s nothing but sand to see”…well yes and no. Yes; there is plenty of sand, some 32km of adrenalin-generating, wheel-spinning, sand-flicking-fun ranging from Stockton (near Newcastle) in the south to Anna Bay in the north, with dunes standing more than 20 to 30 full sized 4WD wagons high. Perhaps they don’t look all that substantial while you’re driving on the coastal sections and peering West into the huge dunes, but when you’re amongst the pure, vegetation-free, shifting sands, they seem positively gigantic and daunting to the point of nerve racking, especially at the peak of every dune as you take your sand-filled boot off the brake at the last second with gentle accelerator pedal to ensure a vertical and safe decent in your 4WD. It’s this last second lack-of-vision (other than skywards) that causes hesitation as you just never know how soft, how steep and how far down each dune will be – unless of course you’ve done the right thing and exited your vehicle first for an eyeball over the edge. Don’t be tempted to play the hero and hit the tops of dunes at speed, you will come unstuck sooner rather than latter with potentially horrifying results. Got the jitters yet? Good, but you needn’t be too worried as driving Stockton Beach is generally a safe affair providing you take adequate precautions for yourself and all other beach users. Of course, you should carry all relevant recovery gear and preferably travel with at least one other vehicle. No; it’s not just all sand: there are freshwater lakes to play in, an array of vegetation ranging from sand-securing grasses (Spinifex, Pigface and Bitou bush) to forested areas, World War 11 history and don’t forget to bring a fishing rod for a free feed or your boardies for a swim in the patrolled flag section at the northern end at Birubi Point. There are many theories, folk law and yarns about what really went on along the 32 long kilometers of this beach during the war years. 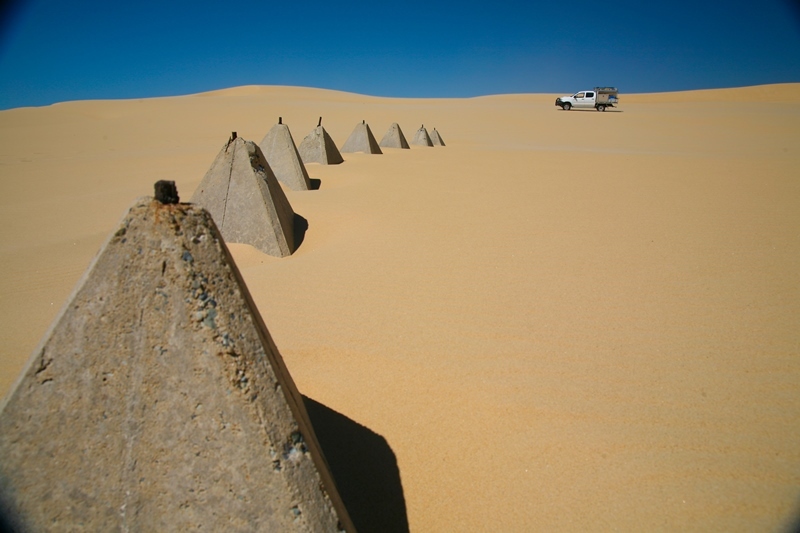 While some of the tank traps (pyramid shaped concrete pillars used to prevent the encroachment of army tanks) are still visible at times amongst the dunes, many have been repositioned at the northern end at the bustling café to border off walkers, parked cars and the myriad of tourer operators. These tank traps in fact lined the whole length of Stockton Beach and into neighboring farm lands and were intertwined with barbed (or razor) wire to ensure the enemy didn’t invade our shores. The Stockton Bight area, along with Fort Scratchely (across the Hunter River from Stockton) and a couple of artillery batteries formed the ‘Northern Defence Line’ during WW11. Weapons testing and armor plate testing was also carried out in the area of Fern Bay at the northern end of the beach, plus it’s rumored there was more than a handful of bombs that were dropped and not detonated in the sand: contact the relevant authorities if you should find one unearthed… and… ummm… please don’t site on it for a photo! Our visit this time saw tank trap number 1465 dated 25/02/1942 found near the Café. Considering only a handful are able to be seen at times amongst the dunes, either a lot have gone missing in action or they’re still buried in the shifting sands just waiting to be uncovered by a fierce storm or big blow from the heavens. There are also remnants of the barbed wire fencing back near the forest, within the dunes and on several rows of star pickets that were claimed to run the length of the beach – more ‘war time furniture’ that becomes exposed at various times. The Pasha Bulker kept all eyes glued to the tele recently when she ran aground just south of Stockton Beach at Newcastle; it was successfully refloated and removed. The next most well-known ship to hit our shores (literally) is the MV Sygna, a Norwegian bulk carrier, which docked its 53 tonne into the shallows in a wild storm back in 1974. Its decaying wreck stills plays host to many a photographer at the southern end of Stockton Beach. There have been countless other ships run aground in the general area, of which one can at times be seen during low tide and if the sand has been drawn out from around its rusting skeletal remains. There is also said to be the remains of a wrecked aircraft in the dunes, but unfortunately sand drifts have covered it over in recent years and we’ve not been able to locate it despite our GPS tracking efforts and a little eager digging just for the sake of it – just imagine if we had of dug up a whole airplane! Rather than just being for the local fisherman as most believe, ‘Tin City’, as it is affectionately known, was originally conceived due to the high number of ship wrecks happening in the late 1800’s. The sheds were host to supplies, provisions and shelter for the seamen of the time. Additional shacks were built during the Great Depression for those unfortunate not to be housed in ‘town’. They were then removed during the Second World War to make way for an Army camp and then rebuilt for the fishermen at a later date. The current Tin City is unique and one well worth visiting. Movie goers may recognize scenes from Mad Max whereby a ‘pub’ was constructed for the movie. Currently, the shacks are on a 99 year squatter’s lease and cannot be rebuilt if destroyed, nor can additional structures be built. They are solar and wind powered and utilise freshwater from the underground water table. A couple of satellite dishes were spotted on this trip, so despite our lacking an internal visit, presumably most mod cons are available inside to cater for the owner fisherman and their mates. While travelling amongst the dunes, you’ll notice piles of long-ago emptied shells and bones of birds, lizards and small animals. These Middens are the leftovers of the Worimi Aboriginal tribe’s meals. It is prohibited to drive over or disturb these Middens, or any other remains that may become uncovered in the sand, so please do keep off them. Stockton Beach was recently handed back to the Worimi people and is co-managed with the NPWS. Paradise for a fisho is selecting from one of the many ‘gutters’ along a long beach front, seeking out fresh bait (pippies and sand worms), casting, retrieving a variety of fish, cooking and eating on the spot while delighting in the natural beauty that is Stockton Beach. There is mile after mile of fishing spots to choose from, which generally makes a secluded spot easy to procure. If you haven’t experienced the massive dune systems of Stockton Beach, treat yourself to at least a day visit in either your own 4WD or one of the many tour operators that are based at the northern end of the beach front, just down from the Café at Birubi Point. Chances are you’ll cop sand in your 4WD, food, cloths…and most places of your body, but that’s all part of the fun of visiting one of Australia’s largest sand masses. Don’t forget to take a piece of cardboard for the kids (little and big) to surf the dunes; it’ll provide a heap of adrenalin, smiles and laughter… just remember to keep your eyes and mouth wide shut – you’ve been warned! Send us your photos of your whole family barreling down the dunes; if nothing else we’ll get a good laugh out of it! Heading north from Sydney, you’ll exit the Pacific Highway, to the southern end of Stockton Beach, just a few hundred meters north of the Hexham Bridge (near Newcastle), into Tamago Road after which you’ll arrive at the Lavis Lane entry point, which then takes you onto the beach via Macs Track. Further north, near Anna Bay (just south of Nelson Bay) at Birubi Point, is the northern beach entrance, off Gan Gan Road, then into James Paterson Street – an easier route for the inexperienced and those with camper trailers as the Lavis Lane route can become quite rutted from traffic with soft patches that’ll catch even the experienced at times. Be sure to lower tyre pressures before getting into the soft stuff. There are two types of permits available for Stockton Beach: a beach vehicle permit (for standard road registered 4WD’s and only for one nominated vehicle) and a recreational vehicle area permit (for conditionally registered vehicles – Quad bikes, trikes, ATV’s and the like). Both permits can be purchased for three days at $10.00, or 12 months for $30.00. Pensioners can get the 12 month beach permit for $15.00. Speed limits of 40km/h applies and 20km/h within 100m of pedestrians and other vehicles. Pedestrians have right of way at all times. Permits can be purchased from Birubi Beach Service Station at Anna Bay, Birubi Beach Holiday Park, Tackle Power at Sandgate, Out of Town 4WD at Barnsley, Mobil Service Station at Salt Ash, Port Stevens Visitor Centre at Nelson Bay, Medowie Tyre and Auto Centre at Medowie and the Metro Service Station on Lavis Lane at Williamtown. Alternatively, you can call (02) 4984 8200 with credit card details at NPWS Region Office, but you’ll need to plan ahead so the pass can be mailed out. Both entrances have service stations for fuel and light refreshments, while the northern entrance has full shopping facilities at Anna Bay. If you should get stuck while driving on Stockton Beach, both Hummer Tours (0428 267 184) and Fenwicks Towing will come to your rescue – at a price! Year round fun can be had at Stockton Beach. It can be windy most times and summer is best for the patrolled swimming zone at the northern end. Rain can make the dunes easier to drive on as it packs the sand down firmer, while in the summer peak season the sand can become quite soft due to the lack of rain and increased traffic. Up until mid-2012 camping was permitted within 100m of the high water mark (no extra fees were applicable) and you had to supply your own firewood and toilet. At the time of writing, camping has been banned due to the extensive storm and flood damage to the front dune system, but will hopefully re-open soon. Due to the massive and destructive storms back in mid-2012, along with smaller damaging storms in 2013, there are restrictions on camping and access. Drivers are encouraged to practice due care at all times along the beach front (which is only accessible at low tides until natural beach nourishment occurs) as large ridges, drop-offs and soft sand are evident. Do remember that the conditions are ‘dynamic’ (ever changing) so do take care while out having fun. For the latest conditions and restrictions, check the following web sites.